Thermal Stress Relieving / PWHT | Rode Welding Inc. Among our custom fabrication capabilities, Rode Welding provides thermal stress relief services. Welding, while a highly cost-effective and proven fabrication method, often puts heavy stress on the work materials and can result in cracking and distortion. Our thermal stress relief capabilities help to release and eliminate internal stress by raising the temperature of the workpiece to slightly below its transformation point. Arc welding filler material changes size and shape during the welding process, expanding as it heats and contracting and shrinking when it cools again. These effects pull and strain the metal, causing irregularities in geometry, thickness, and surface finish. The thermal stress relief process improves the overall quality of the weld by reducing any distortion and warping that may result from such stress. By heating up the materials, the thermal stress relief process provides energy and diffuses the atoms, allowing them to redistribute any imperfections that result from welding. The metal becomes more malleable and receptive to the welding process and its benefits. 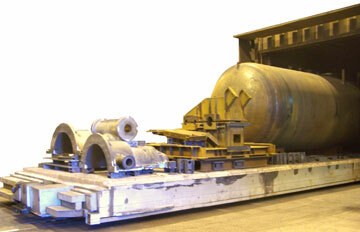 At 14’ H x 14’ W x 42’ L, Rode proudly operates the largest thermal stress relieving furnace in Chicago, IL. This on-site car bottom furnace heats up to 1750° Fahrenheit and can perform post-weld treatments on parts up to 100,000 lbs. These secondary processes include heat treatment, stress relief, hot plate roll forming, and normalizing, all of which help to remove residual stresses from welding. Our furnace is completely digitalized, which means that our team can calibrate the controls so as to meet each customer’s specific requirements for rate of rise, hold time at temperature, rate of cooling, and more. To ensure that we achieve the proper heat treat cycle for your part, we attach thermocouples directly to the workpiece. For over 65 years, Rode Welding has been perfecting our thermal stress relieving and custom fabrication services. Our highly skilled and experienced team is committed to safety, quality, and on-time delivery. Throughout the entire manufacturing process, we will work with you at every touchpoint to make sure you receive the right part at the right price. To learn more about our thermal stress relief capabilities, contact Rode Welding.